Would you recommend Kin Calendar to a friend? @troblous Is that seen just through the referrer link? Hey there! Are you crying because Sunrise is living its last hours? I know I do. 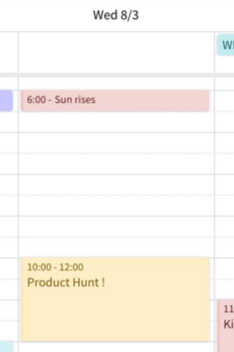 These guys have been working on a replacement for Sunrise and, even if there is still work to do, their calendar is already working very nicely. @troblous @syswarren YESSSS!!! Thank you for the product and the hunt. @syswarren Thanks, needed a Sunrise replacement! @syswarren This is exactly what I need! Thanks for this! @lucascerdan Signed up, excited to try. Any essential features adopted from Sunrise? Any distinguishing ones? I've been freaking out for several months because I couldn't find a suitable calendar replacement for Sunrise. When I found Kin about 2 weeks ago, I finally felt relieved that someone was stepping up to fill the large hole in my life that Sunrise is leaving behind! It's not up to the par that Sunrise set quite yet, but they have a very solid start and are improving on it rapidly, so I'm sure they will get there in the coming months. What is the best calendar app that works with Google, other than Google Calendar?